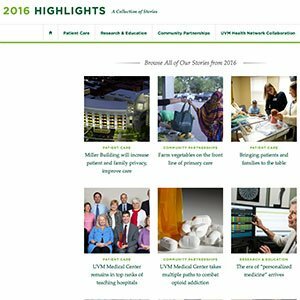 The UVM Medical Center wanted to migrate their annual highlight stories from Sharepoint to a separate WordPress site for easier content management and greater functionality. Working with the fabulous designs from Corey Machanic and his Bootstrap/LESS prototype, I created a custom journal structure in WordPress and helped train the UVM Medical Center staff. Michael worked seamlessly with our team on a key project that required him to provide creative direction, technical guidance, training, and to coordinate with other vendors. He did a great job on all counts, and was very responsive to our changing needs.